My friend wanted to go to Russ & Daughters so I bought some smoked salmon (Western Nova Smoked Salmon) and salmon roe. As soon as I bought them I thought of making a cold pasta dish using those two ingredients. 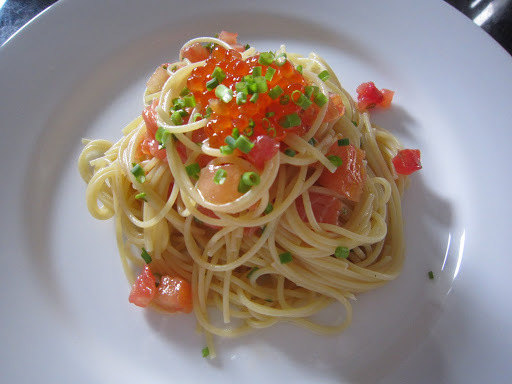 In Japan, 冷静パスタ(reisei pasta or cold pasta) is quite a common dish during the summer months but it seems in the US only cold short pasta dishes (like salads) are common. I bought an organic heirloom tomato, organic lemon and organic chives at Whole Foods Bowery for the vinaigrette. The vinaigrette was basically just lemon juice, olive oil, salt, black pepper and diced tomatoes. Once I cooked the thin spaghetti, I cooled it down with cold water (would’ve done it with some ice but didn’t have any!) and tossed it in the vinaigrette. I then tossed in some pieces of the smoked salmon (tore them into smaller pieces) and garnished the dish with chives and salmon roe. 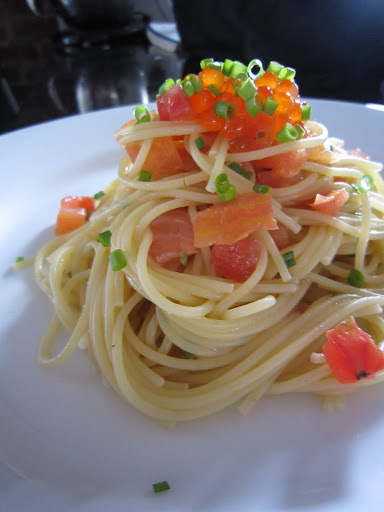 A perfect refreshing pasta dish for the hot summer!